Often times, when a bank lends money to a business, they will require the borrowers to provide disability insurance covering the payments. This is ensures the bank that, should the borrower become sick or hurt, the payments will still be made. The preferred solution would be to prescribe disability insurance that would pay the monthly loan payments and/or pay off the remainder of the loan balance. Banks, credit institutions and leasing companies are logical candidates to provide or recommend Loan/Lease Disability Insurance to benefit their clients. The logic for such firms to concern themselves about the need for Loan/Lease Disability Insurance comes from the very statistics supplied by the loan industry. The Federal Home Loan Bank reports that over its many years it has determined the major cause of mortgage loan foreclosures is disablement of the mortgagee: 48% vs 3% due to death. It is not uncommon for the lending firm to require life insurance as a condition to make the loan. Such insurance covers the consequences created by death (3%) and leaves abandoned the greatest hazard to loan default, disability (48%). Bankers are becoming increasingly aware of the hazards to their loan repayment potential. Roughly 25% of all bankruptcies are tied to an illness or injury. Most often Business Overhead Expense insurance plan benefit periods are too short to satisfy the loan. Additionally, while it may be advantageous for the bank, asking an individual to assign his or her personal disability benefits to the bank would leave the insured’s family seriously vulnerable financially. PIU’s Loan Indemnification Disability Insurance Plan will satisfy the bank requirements. Monthly benefit periods from 1 year to 10 years are available and there are also lump sum benefit options. The plan would be set up to mirror the loan terms with a declining benefit, this type of set up will save your clients in premium costs. 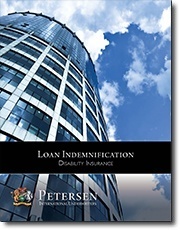 Keep your clients secure with Loan Indemnification Disability Insurance.